Israeli Jews across the religious spectrum strongly support the idea of Israel as a Jewish state and a homeland for Jewish people around the world. Overall, majorities of Jews say Israel was given to the Jewish people by God and that a Jewish state is necessary for the long-term survival of the Jewish people. Nearly unanimously, Jews support their diaspora population’s right to move to Israel and receive citizenship, and most agree that Jews deserve preferential treatment in Israel. But Israeli Jews are divided when it comes to the status of the country’s Arab minority; roughly half say Arabs should be expelled or transferred from Israel, while the other half disagree. While Israeli Jews value Israel as a Jewish state, they also see the Jewish diaspora as important. Nearly seven-in-ten say a thriving Jewish diaspora is necessary for the long-term survival of the Jewish people. And even though American Jews take a different view of Israel’s long-term challenges and diverge from Israeli Jews in their religious observance and political views, Israeli Jews value their connections with American Jews. For example, Israeli Jews generally agree that Jews in Israel and those in the U.S. share a common destiny to at least some extent. And roughly six-in-ten say Jews in the U.S. have a good influence over how things are going in Israel. Roughly six-in-ten Israeli Jews (61%) say God gave Israel to the Jewish people, while 12% say this is not literally true. The remainder – those who say they do not believe in God or do not know if they believe in God – were not asked this question (27%). In part because they are more likely to believe in God, more observant Israeli Jews are more likely than their less-observant peers to say God gave the land of Israel to the Jewish people. Nearly all Haredim and Datiim say God gave Israel to the Jewish people. Among Masortim as well, the vast majority (85%) say God gave the land of Israel to the Jewish people. Far fewer secular Hilonim (31%) hold this view; half of Hilonim do not believe in God. Fewer than half of Jews of Ashkenazi ancestry (46%) believe God gave Israel to the Jews, compared with nearly eight-in-ten Sephardim/Mizrahim (78%). And those who speak Russian at home (30%) are far less likely to believe this than are Hebrew-speaking Jews (65%), in part because many Russian-speaking Israeli Jews do not believe in God (54%). All Yiddish-speaking Jews in the survey believe God gave Israel to the Jewish people. Not surprisingly, Christians and Druze in Israel are less likely than Jews to believe God gave Israel to the Jewish people. But even among these groups, nearly one-in-five say God gave Israel to the Jews (19% and 17%, respectively). Due to political sensitivities, Muslims in Israel were not asked this question. Most Jews in Israel say “Zionist” – a term referring to someone who supports the establishment and protection of a state for the Jewish people in Israel – describes them “very” (30%) or “somewhat” (44%) accurately. Both Yiddish- and Russian-speaking Jews in Israel, although at different ends of the spectrum of religious observance, are less likely than Hebrew-speaking Jews to say the term Zionist captures their identity. Jews who describe their political ideology as “left” or “right” are about equally likely to say the term Zionist describes them at least somewhat accurately. Overall, 34% of left-leaning Israeli Jews say the term Zionist describes them very accurately, compared with 37% of those on the political right. Virtually all Israeli Jews (98%) agree that it is the birthright of all Jews around the world to make aliyah to Israel. This view is all but unanimous across a variety of religious and demographic groups. In fact, 87% of Israeli Jews strongly agree that all Jews have the right to make aliyah. Most Israeli Jews (79%) also say Jews deserve preferential treatment in Israel. This view is especially common among Haredim (97%) and Datiim (96%); roughly seven-in-ten in each group strongly agree with this position. Hilonim are somewhat less likely to say Jews deserve preferential treatment in Israel; still, about seven-in-ten (69%) agree with this view, compared with 29% who disagree. Jews on the political left stand out for the relatively small share who say Jews deserve preferential treatment in Israel (38%). A large wave of immigration from the former Soviet Union began in 1989. In the early 1990s, nearly 800,000 immigrants arrived in Israel from the former Soviet Union (FSU).24 ). In this survey, about three-quarters of Jewish respondents from the former Soviet Union made aliyah between 1990 and 1999. An additional 15% of FSU Jews say they made aliyah from 2000 to 2014, while a similar share (12%) say they made aliyah prior to 1990. Most immigrants from the former Soviet Union (73%) say they continue to primarily speak Russian at home. For more information about immigration from the former Soviet Union, see this sidebar in chapter 5. Datiim are especially likely to favor the expulsion of Arabs. Fully 71% say Arabs should be transferred, while about a quarter (26%) disagree. Hilonim lean in the other direction: Most (58%) disagree that Arabs should be expelled, including 25% who strongly disagree (see expanded table below). 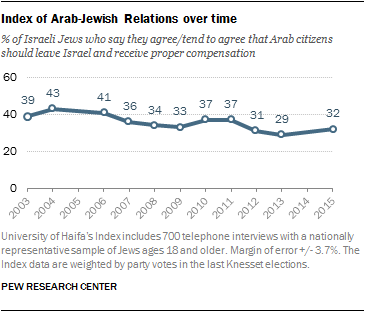 But even among secular Jews in Israel, more than one-third (36%) favor Arabs’ expulsion from the country. Ethnicity plays a role in views on this issue as well. Sephardim/Mizrahim are more likely than Ashkenazim to favor the expulsion of Arabs from Israel (56% vs. 40%). While religious identity influences Israeli Jews’ views on the expulsion of Arabs, the survey finds that even after taking this and other demographic factors into account, Jews’ views on the expulsion of Arabs are most strongly correlated with their political ideology. There is no pending proposal in the Israeli Cabinet or legislation in the Knesset to expel Arabs either from Israel or from the West Bank. However, some Israeli political figures have raised the possibility of an expulsion or voluntary “transfer” of the Arab population, and at least two other recent surveys have included questions about variations on this idea. The University of Haifa’s Index of Arab-Jewish Relations in Israel has asked, “Do you agree, tend to agree, tend to disagree, or disagree with the following statement: Arab citizens should leave the country and receive proper compensation.” (Emphasis added.) This question has been asked 11 times since 2003, with only modest fluctuations in opinion. The most recent survey, conducted in 2015, finds that 32% of Israeli Jews agree or tend to agree with the statement, while 64% disagree or tend to disagree. In addition, an October 2015 poll conducted by the Maariv newspaper asked Israeli Jews whether they “support the idea of a voluntary transfer of Palestinians from Judea and Samaria,” also known as the Israeli-occupied West Bank. (Emphasis added.) It finds that a majority (58%) of Jews favor this idea, while 26% oppose it. The further to the left Israeli Jews place themselves on the political spectrum, the more likely they are to oppose the expulsion of Arabs from Israel. An overwhelming majority of Israeli Jews on the left either disagree (25%) or strongly disagree (61%) that Arabs should be expelled from Israel. By contrast, roughly seven-in-ten of those on the right agree (35%) or strongly agree (36%) that Arabs should be transferred. Jewish residents of the West Bank are more likely than Jews living elsewhere to say God gave the land of Israel to the Jewish people (85% vs. 60%). In part, this difference is a reflection of the fact that a majority of Jews living in the West Bank (63%) are Orthodox (Haredi or Dati), compared with 20% of Jews living elsewhere. But overall, settlers share largely similar views to Jews living elsewhere on the rights of Jews and Arabs in the Jewish state. For example, near-universal proportions of Haredim, Datiim, Masortim and Hilonim living in the West Bank say Jews around the world have the right to make aliyah to Israel, compared with similar proportions among these subgroups living elsewhere in Israel. Roughly half of settlers (54%) think Arabs should be transferred or expelled from Israel, as do 47% of Jews who live elsewhere. On this issue, Hilonim living in the West Bank (22%) are somewhat less likely than Hilonim living elsewhere (36%) to say Jews should be expelled or transferred from Israel. Among other Jewish subgroups, there are no statistically significant differences in opinion on this issue between Jews living in the West Bank and Jews residing elsewhere. While Israeli Jews all but unanimously support the idea that all Jews around the world should have the option to move to Israel, they are divided on the question of whether Jews already in Israel should feel an obligation to stay there. More than four-in-ten (46%) say Jews in Israel should remain in Israel, “even if it means giving up the good life elsewhere.” But a similar share (47%) take the opposite stance, saying Jews in Israel should “feel free to pursue the good life anywhere in the world,” even outside of Israel. In general, members of the more religiously observant Jewish identity categories are more likely to see Israeli Jews as having an obligation to live in – and stay in – Israel. Three-quarters of Datiim say this, as do two-thirds of Haredim and 55% of Masortim. Hilonim lean in the other direction: Roughly six-in-ten (63%) say Jews in Israel should feel free to pursue the good life anywhere. Younger adults are somewhat more likely than older Israeli Jews to say Jews in Israel should feel free to move abroad. Half of adults under age 50 say this (50%), compared with 42% of those ages 50 and older. And highly educated Jews are more likely than those with less education to say Israeli Jews should feel free to leave Israel to pursue economic opportunities elsewhere. Jews were asked, in two separate questions, whether a Jewish state and a thriving Jewish diaspora are each necessary for the long-term survival of the Jewish people. Although more say a Jewish state is necessary (91%), a solid majority (69%) also say a strong Jewish diaspora is vital to the long-term survival of Jews. Haredim are less likely than other Jews to say a Jewish state is necessary for the long-term survival of the Jewish people, perhaps in part because of some Haredi Jews’ opposition to the formal creation of a Jewish state before the arrival of the Messiah. Nevertheless, about two-thirds of Haredim (65%) say a Jewish state is necessary. Yiddish-speaking Jews, however, stand out on this question. Only 29% of the Yiddish-speaking Israeli Jews surveyed – all of whom are Haredi – say a Jewish state is necessary for the long-term survival of Jews. Far more (64%) say a thriving Jewish diaspora is necessary. Overall, Haredim are closer to other Jewish subgroups on the question of whether a thriving diaspora is necessary for the long-term survival of the Jewish people. Majorities across the religious spectrum say it is necessary. All Israeli respondents in the survey were asked to name, in their own words, what they see as the single most important long-term problem facing Israel. The two most commonly cited types of issues are those related to security threats, violence or terrorism (38%) and economic problems (39%). An additional 14% describe other social, religious or political problems, such as racism, discrimination or religious divisions. Haredim are more likely than other groups to say Israel’s biggest long-term problem is socio-political in nature, and less likely to name security threats and terrorism as the country’s biggest issue. 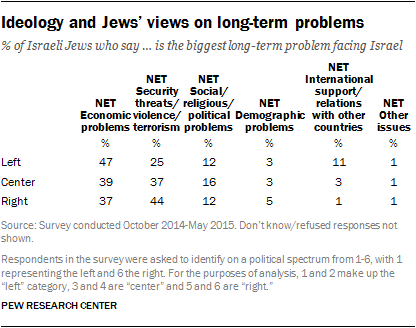 But roughly three-in-ten or more respondents in all four major Jewish identity groups point to economic issues as their country’s most challenging long-term problem. Among Israeli Jews, there are only modest differences by age, education level and gender on this question, although Jews with less than a high school education are more concerned about economic problems (47%) than security threats (31%). Israeli Jews who place themselves on the political right are considerably more likely than those on the left to identify security threats, violence and terrorism as the country’s biggest long-term problem (44% vs. 25%). Nearly half of left-leaning Israeli Jews (47%) say economic problems are the primary issue. Relatively few Israeli Jews overall (3%) see international support and relations with other countries as Israel’s biggest long-term problem. But roughly one-in-ten on the political left (11%) say this is the foremost problem. Arabs are more likely to name economic problems (42%) than security issues (30%) as the biggest long-term problem facing Israel. One-in-five Israeli Arabs (20%) point toward social, religious or political problems as the biggest challenge facing the country. Pluralities of Muslims, Christians and Druze – roughly four-in-ten among each religious group – name economic problems as the biggest issue facing Israel. Israel and the United States are home to by far the world’s two largest Jewish populations. About two-thirds of Israeli Jews say they have either “a lot” (26%) or “some things” (42%) in common with Jews in the United States. Overall, 31% of Israeli Jews say they have “not too much” (23%) or “nothing” (7%) in common with American Jews. Despite the fact that by a variety of standard measures of religious observance, American Jews are less religious than Israeli Jews, Haredim in Israel are somewhat more likely than other Jewish subgroups to see common ground between themselves and Jews in the U.S. (It is possible Israeli Haredim are thinking of Haredim in the U.S., who make up about 6% of U.S. Jews, when making this comparison.) Roughly eight-in-ten Haredim (81%) say they have either a lot in common (36%) or some things in common (45%) with Jewish Americans. By comparison, 69% of Datiim, 64% of Masortim and 67% of Hilonim say they have at least some things in common with American Jews. Overall, Israeli Jews who have visited the U.S. are somewhat more likely than those who have never been to America to say they have at least some things in common with American Jews (74% vs. 64%). The differences in opinion between those who have visited the U.S. and those who have not are particularly large among Orthodox Jews (Haredim and Datiim). For example, roughly nine-in-ten Haredim who have visited the United States (92%) say they have at least some things in common with U.S. Jews, while 76% of Haredim who have never visited the U.S. share this view. Again, Haredim are more likely than other Israeli Jews to see this shared future for American and Israeli Jews. Fully 88% of Haredim in Israel say Jews in Israel and Jews in the U.S. share a common destiny, including 43% who say this destiny is shared “to a great extent.” Roughly seven-in-ten or more Datiim, Masortim and Hilonim see a common destiny between U.S. Jews and Israeli Jews. Overall, Israeli Jews who have visited the U.S. are about as likely as those who have not to say they share a common destiny with American Jews. A majority of Israeli Jews (59%) think that, overall, U.S. Jews have a good influence on the way things are going in Israel. Relatively few (6%) say U.S. Jews have a bad influence. Roughly three-in-ten Israeli Jews (31%) say the influence of American Jews in Israel is neither good nor bad. There are relatively few differences across Jewish subgroups on this question. At least half of Haredim, Datiim, Masortim and Hilonim say American Jews have a good influence, while about one-in-ten or fewer say the influence from U.S. Jews in Israel is negative. There also are relatively few differences among Jewish demographic groups on the question of whether U.S. Jews have a good or bad influence in Israel. Majorities of younger and older Israeli Jews, Jews with different levels and types of education, men and women, and Ashkenazi and Sephardi/Mizrahi Jews say U.S. Jews have a positive influence on Israel’s affairs. Left-leaning Jews are somewhat more likely than those in the center or on the right to say U.S. Jews have a bad influence in Israel (18%). Still, more than half of left-leaning Israeli Jews (54%) see American Jews’ influence as positive. Overall, Jews who have visited or lived in the United States are no more or less likely than others to say American Jews have a positive influence in Israel. Haredim who have visited the United States, however, are considerably more likely than Haredim who have not visited the U.S. to see the influence of American Jews in Israel as positive. Among Haredim who have visited the U.S., 71% say U.S. Jews have a good influence in Israel; by comparison, 54% of Haredim who have never visited the U.S. share this view. Israeli Arabs are considerably more likely than Jews to say American Jews have a bad influence on the way things are going in Israel. Roughly a third of Arabs (35%) say this, compared with just 6% of Jews. Still, 39% of Israeli Arabs say American Jews have a good influence over the way things are going in Israel. Muslims and Christians have similar views on this question, and Muslims are somewhat more likely than Druze to say American Jews are having a bad influence on the way things are going in Israel. Muslims across different demographic groups (age, gender, education) are about equally likely to evaluate American Jews’ overall influence in Israel as negative. 1. Comparisons between Jews in Israel and the U.S.